It’s another wonderful Thursday…and time for “Spot the Rock” again! Though this red rock may look familiar, something tells me it’s quite peculiar. 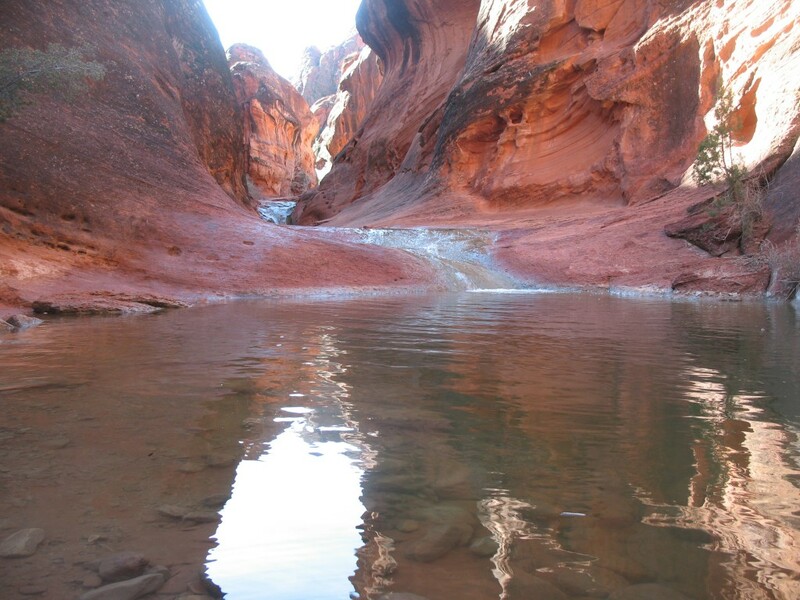 If you know where this slot canyon hides, try your luck and tell us where it resides. Like us on FACEBOOK or follow us on TWITTER to participate in “Spot the Rock”! This Spot the Rock photo was taken in Quail Creek Canyon, roughly 15 miles northeast of Saint George, Washington County. This section of Quail Creek Canyon is located within the Red Cliffs Desert Reserve, Red Cliffs National Conservation Area, and Cottonwood Canyon Wilderness. The trailhead for this site is found in the Red Cliffs Campground. The red rocks of the Red Cliffs are composed primarily of Jurassic age Navajo Sandstone. The towering Pine Valley Mountains, which provide the water for the creek, are a volcanic feature called a laccolith. This area of Utah is unique in that it is a transition zone between the Great Basin, Colorado Plateau, and Mojave Desert.